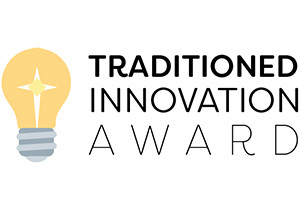 Editor's Note: Try Pie is one of four organizations recently honored with the Traditioned Innovation Award from Leadership Education at Duke Divinity. The following is the first in an occasional series of articles about the award winners. It’s a mid-November afternoon, another pie-making Monday at Orchard Hill Church in Cedar Falls, Iowa. In the church kitchen, six teenage girls wearing hairnets, aprons and latex gloves chat about school and music as they roll out dough for 70 large pies. The next Sunday, just in time for Thanksgiving, they will deliver those and other pies -- frozen, unbaked -- to customers who’ve been placing orders for weeks, parishioners both at Orchard Hill and at Harvest Vineyard Church in the adjacent city of Waterloo. To the girls, pie making means employment -- a part-time job that pays $8 an hour. But much more than that, it means education, faith development and reconciliation. 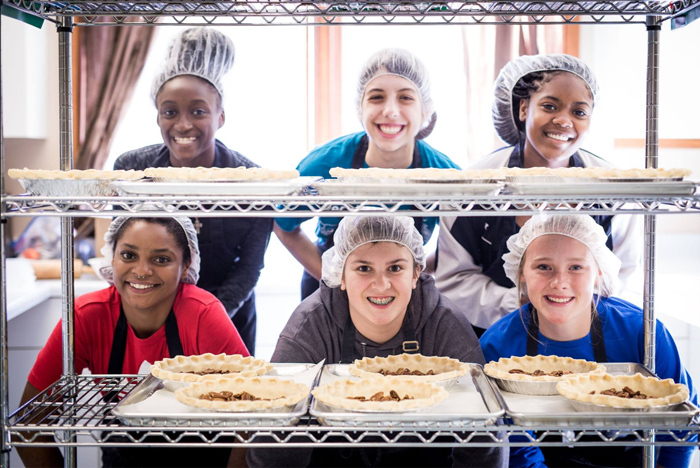 The teenagers work for Try Pie, a Christian social enterprise that seeks to build bridges between the affluent Orchard Hill neighborhood in Cedar Falls, where the girls make and store the pies, and the Walnut neighborhood, a low-income community in Waterloo. The program is part of Link Christian Community Development, a nonprofit organization created by the two churches -- Orchard Hill and Harvest Vineyard -- to help revitalize the Walnut neighborhood. 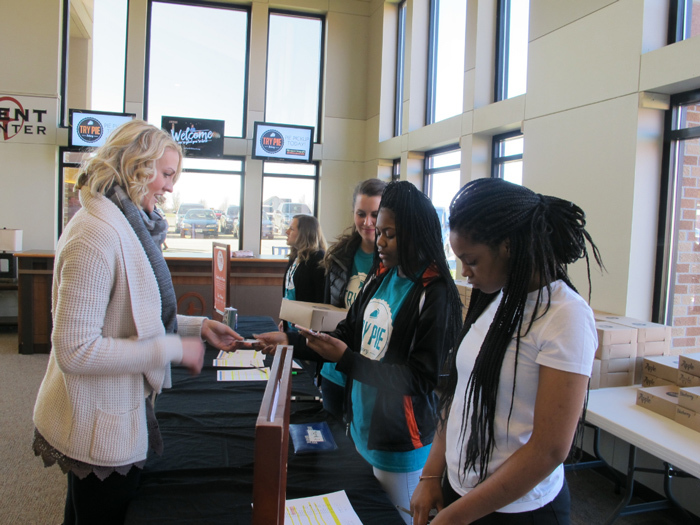 One of several Link programs, Try Pie employs high school girls -- half from Cedar Falls and half from Waterloo -- with diverse ethnic, economic and cultural backgrounds to build bonds that stretch across differences of race and income. Since the program began in 2014, 15 teens have participated, including the current staff of eight pie-makers. Try Pie piemakers pose in the Orchard Hill Church kitchen with pecan pies in progress, a fall favorite. Several are from the Walnut neighborhood, a historic section of east Waterloo dating back to the turn of the last century. Today, many lots in the neighborhood are vacant, and boarded-up windows, dangling gutters and missing shingles mark several of the 60 or so houses that still stand. The area’s median household income is $12,424, just above the poverty line for one person. And unemployment is high, especially for the 64 percent of neighborhood residents who are African-American. For African Americans in Waterloo-Cedar Falls, the unemployment rate is 24 percent. It’s one of many reasons that Waterloo-Cedar Falls made the 2015 list of 10 Worst Cities for Black Americans. Laura Hoy, the director of Link, calls these and similar statistics “the sin effects of segregation.” Try Pie is working to ameliorate them through community building, job skills honing and financial stewardship training on Mondays, Tuesdays and Saturdays during the school year. Supported by teams of adult and youth volunteers, the girls have worked mostly during two 10-week sessions preceding Easter and Thanksgiving -- prime seasons for selling pies. What ordinary acts could be avenues to employment, education, faith development and reconciliation in your community? Both a youth ministry and an entrepreneurial venture, Try Pie is a reminder to those who lead churches and youth ministries that “innovation” doesn’t have to be intimidating, requiring extravagant resources and programs. As Try Pie suggests, sometimes innovation can happen with something as traditional and as simple as pie. Saturdays are pie-selling days. And on a Saturday morning last November, Erin Ochoa and Allison Stuenkel took their turns staffing Try Pie’s makeshift retail outlet at the Habitat for Humanity ReStore in Waterloo. Just inside the store, the two stood behind a table stacked with neatly packaged mini pies, assembled and frozen earlier but baked that morning by Try Pie co-director Megan Tensen, 26. Allison Stuenkel, Katahvia Glasper, Candice Smith, Emily Wckner and Jayda Hamtpton end the last shift of the 2016 Spring baking season with an impromptu song and dance. Stuenkel, a Try Pie veteran now in her second year, nodded in agreement. A junior from West High School in Waterloo, she was helping train Ochoa on the retail end of the operation. A pleasant gentleman stopped at the table and leaned on his cane. “What kind of pie are you selling?” he asked, pulling out his wallet. “Just pumpkin,” Ochoa said. He peeled off four singles and listened to Stuenkel explain Try Pie. “Can I give you a tip?” he asked. Once, he said, two job applicants interviewed for a position. The one who got the job wore socks that matched his pants; the other applicant did not. “Don’t leave anything unnoticed,” the man said. A customer buys a pie from Imari Davis and Jayda Hampton after Sunday services at Orchard Hill Church. In addition to the customer-service skills they learn at the Habitat ReStore on Saturdays, the Try Pie girls learn about résumé writing, job interviewing and financial literacy after dough making on Tuesdays. Invited business professionals -- financial advisors, human resources directors and others -- come to work with the teens roughly every other week, and the girls also rehearse how to interact with customers. Off campus, the teens meet with adult mentor volunteers to “go a little deeper into class topics,” Tensen said. The mentors know Try Pie well, typically having started with the program as shift volunteers. They continue to make pie alongside the girls occasionally throughout the semester. Try Pie pays the teens not only for their work but also for their time in the classroom and with mentors. How might this change the way Christian institutions think about value and where they invest time and resources? The girls are paid for their time in the kitchen, in the classroom and with their mentors. It adds up to an average of seven to 10 hours a week each semester. Reconciliation was what Link’s director, Hoy, had in mind when she spearheaded the creation of Try Pie in 2014. “I grew up going to church in the Walnut neighborhood and have always had a heart for it,” Hoy said. She envisioned Try Pie as one more way to inspire reconciliation and community rebirth in the neighborhood. The initial seed for the program was planted a few years earlier when Hoy and a 10-year-old boy from the neighborhood took a walk together. As they came to an abandoned building, the two stopped. “Wouldn’t that make an amazing youth center?” Hoy asked. “It wouldn’t just be for poor black children, would it?” the boy responded. Hoy was stunned. It was something that she would never forget. “He was a poor black child, but he didn’t want to be part of one more program,” she said. Whatever new program Link started, Hoy now realized that it had to embrace everyone. “I knew we needed to have every race and income if we were going to have reconciliation and a new story,” Hoy said. Before long, Hoy invited Bob Lupton, a Christian community developer and urban neighborhood consultant, to evaluate the Walnut area. The author of “Toxic Charity” and other books, Lupton was enthusiastic about the neighborhood and the prospects for revitalization. Lupton’s advice was consistent with an earlier neighborhood survey, which had found that Walnut residents wanted help finding jobs and positive activities for teens. Hoy thought she had seen just the thing. The Cookie Cart bakery, a youth employment training program in Minneapolis, seemed like a perfect model to replicate. Created in 1988, the nonprofit offers jobs and guidance to youth from the troubled neighborhood of North Minneapolis. During a summer 2013 meeting, Hoy asked her team at Link what they thought: Would something like that work in Waterloo-Cedar Falls? 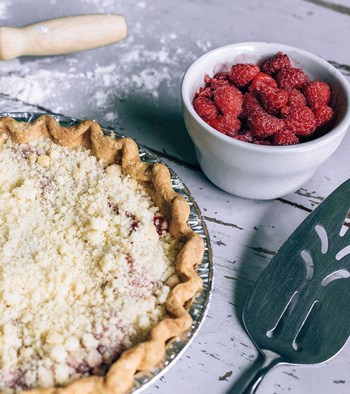 Raspberry pie is a popular item in Try Pie's spring lineup. Tensen, then a 23-year-old youth minister at Orchard Hill and a Link team member, loved the idea. She and Hoy talked with some girls from area high schools and asked whether they wanted to start a business. Their answer? A resounding yes. By January 2014, Tensen, Hoy, five high school girls and a few volunteers had settled on pie. Try Pie would pay the girls to make and sell pie and learn business practices. Orchard Hill would foot the bills to begin with, as the enterprise worked to become self-supporting. The first setback came when the group tried to make crust. But the novice bakers took a field trip to Des Moines to meet with a veteran pie-maker. Who are the potential partners in your community with expertise to share with others? “We learned how to crank out pie dough really fast,” Tensen said. Fast enough to make and sell 80 cherry and apple pies that first Easter, just weeks after the trip to Des Moines. “Our cherry pie was kind of runny at first, but it tasted good,” Tensen said. Fueled by the enthusiastic and entrepreneurial spirit of its teen employees, young adult staff and volunteers, Try Pie grew quickly. By the summer of 2015, the business was making enough money to be able to pay its teen staff for seven to 10 hours of work and classroom time per week. Since then, Try Pie has continued to grow. Last year, it sold 4,688 large and mini pies combined, grossing $23,000, Tensen said. After expenses of $17,800 for teen labor, ingredients, packaging and other costs, the program had net receipts of $5,200. 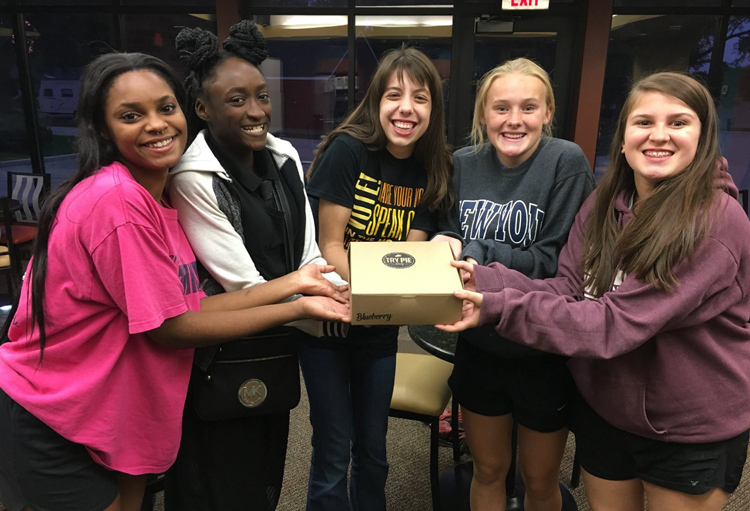 The teen piemakers hold a box containing the 4,000th pie since Try Pie's beginning in 2014. Despite Try Pie’s success, it’s a continuing challenge “to grow both the business and ministry, and maintain the right balance,” Tensen said. Turner agreed. The conventional way of doing ministry to rather than with young people is losing relevance. Social enterprise offers a unique way to do youth ministry, but few templates exist, she said. Even so, social enterprise is increasingly popular both in ministry and more broadly in society. Research shows that teens and young adults want to blaze innovative and meaningful paths. How can your church nurture relational belonging outside of traditional institutional structures? Mark DeVries , the president and founder of Ministry Architects and a consultant for Try Pie, said this new reality has profound implications for the church. That desire, in turn, dovetails with the urgent need for new models of funding and membership in the church today. Self-sustaining entrepreneurial ministry is one answer, DeVries said. “The financial model of ‘pass the plate’ is pretty Baby Boomer-dependent,” he said, and it is dying out. DeVries learned about Try Pie in the summer of 2015, when Tensen and Turner attended a Ministry Incubators Hatchathon , hosted by Ministry Architects, to help develop youth ministry ideas. “We loved that they had developed a working, scalable model for bringing together ministry, particularly ministry with youth, with an entrepreneurial venture as the venue for ministry,” he said. What set Try Pie apart was that it brought together young people from various backgrounds to work together, side by side, DeVries said. More than just facilitating a discussion about race and privilege, Try Pie gives girls a diversity of friendships and an income, which validates the importance of the work they are doing. 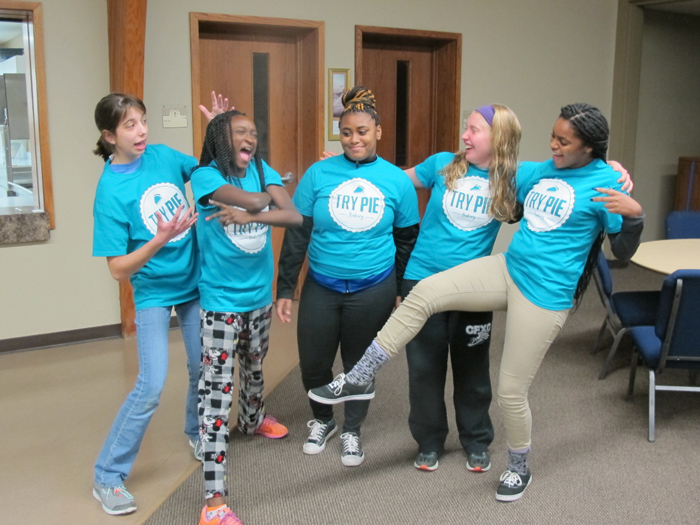 The Try Pie team had what they needed in terms of ministry training and vision, DeVries said. They just needed support in growing and building the business, which they continue to develop with help from DeVries. “We help them think through the nitty-gritty,” he said. Early on, that meant refining Try Pie’s comprehensive business plan. Today, it also means talking through the obstacles -- like not having enough freezer space -- that attend Try Pie’s growth. About 6:30 p.m., after the work was done on that mid-November Monday, it was time to clean up and move into the dining room for dinner. There, the girls, shift volunteers, mentors and directors were served by meal volunteers who signed up on Facebook to cook. At 7 p.m., they push away from the table to form a circle. Each affirms her neighbor: “You are a child of God.” They clasp hands, pray and leave for home in much different parts of town. They take changed hearts with them. What "old-fashioned" practices in your organization could be incorporated into new ministries? It’s an old-fashioned practice for a new-fashioned ministry. Of Try Pie’s first group of teen employees, one is a senior in high school and the other four have graduated and are now attending college. Three of the four are the first in their families to go to college, and Tensen, Turner and Hoy suspect that Try Pie helped make that happen. The future -- freezer space notwithstanding -- looks bright. Try Pie is projecting another record year and is hoping to be able to employ the girls year-round. If demand for the pies continues to rise, both will happen, she said. A goal further down the road will be for Try Pie to become fully self-sufficient, funding the directors’ positions, now paid by Orchard Hill, and reimbursing the church for use of the kitchen. Try Pie is just one piece of what Link is cooking up with the residents of the Walnut neighborhood. Slice by slice, Try Pie -- propelled by teens and young adults with the support of church -- is helping heal this tiny pocket of the world. What seemingly ordinary acts of life, such as making pie, could be avenues to employment, education, faith development and reconciliation in your community? How can your institution partner with others to bring together people from dramatically different neighborhoods? Partnering with a veteran pie maker was vital to Try Pie’s early success. Who are the potential partners in your community with expertise to share with others? How can your community cultivate an environment that encourages young adults to blaze innovative and meaningful paths? Christian institutions tend to collect “old-fashioned practices” to preserve tradition and make meaning. What practices in your organization could be incorporated into new ministries?